ROCKFORD, Ill. – Jordan Schroeder and Dennis Gilbert scored within 40 seconds of each other late in the third period to erase a 3-1 deficit, but Robbie Russo capitalized on the power play with just 2:20 remaining in regulation to tip the Tucson Roadrunners over the Rockford IceHogs 5-3 on Saturday night at the BMO Harris Bank Center. The defeat snapped the IceHogs' win streak at a season-high six straight games. Rockford treated a near-sellout crowd of 5,957 to a thriller of a finish, drawing even at 11:08 in the final frame. Schroeder sparked the comeback with a rip from the left side on a cross-ice feed from Dylan Sikura. The forward blasted the puck top shelf past netminder Adin Hill for his 11th goal of the season and the Hogs’ eighth power-play goal of the series. Gilbert followed suit just 40 seconds later, and with the Hogs trailing just 3-2, completed the comeback with a well-placed shot from the left circle that went just outside the reach of Hill. The tally was the first of Gilbert’s AHL career and secured him his first point streak of his rookie campaign. Rockford continued to pressure Hill late into the third before going a man down on an interference call at 15:55 in the stanza. The Hogs successfully killed off the first 1:45 of the power play, but Russo wired a puck in from just in front of the blue line to help Tucson escape with the win. 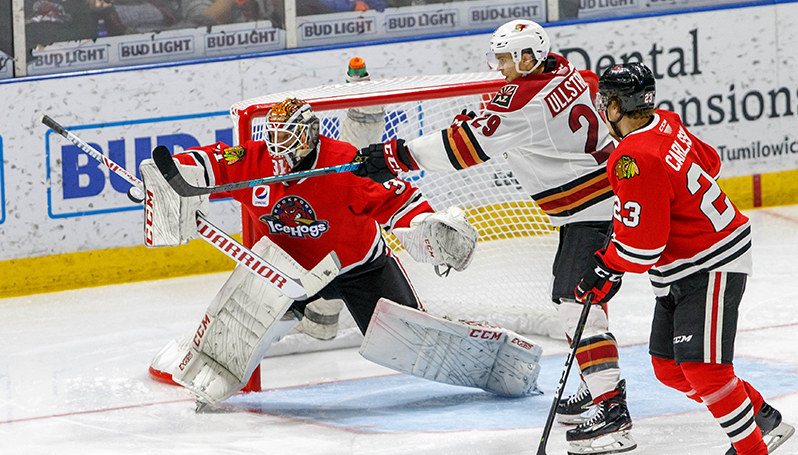 Hill stopped 27 of 30 pucks in the victory for the Roadrunners, while Rockford goaltender Anton Forsberg made 34 saves on 38 shots in the defeat.